You even ship screws and anchors in the package. This is not what I expect from an inexpensive product. If you put the t-rail on and didn't want it there is a long thin metal tool with a loop that you use to remove the t-rail. As there were no instructions I had to search around and figure it out on my own to remove it from my X-3. Hope this helps anyone else in the same boat. I just purchased the X3. So far so good. Hopefully you can point me in the right direction for a few things. 1. Recommendations for locating, orienting, and mounting the unit. I realize that there are many factors in determining where to mount the unit, but some general guidelines would be very helpful. For example is wall / vertical or ceiling / horizontal preferred? 2. Instructions for mounting the unit. It comes with a Y shaped bracket that clicks into the 2 screw notches on the back. Is this for some specific application like drop ceilings? Mounting is totally dependent on what you have to work with. Just go with whats easy! I always recommend mounting flat on a desk or from the ceiling (horizontally). The included clips are for mounting to t-rail of drop ceiling. I have just purchased an Xi-1. It came with two screws and two wall plugs but no brackets of any kind. I can see no way that it can be mounted to a normal plaster ceiling. Help please! OK - I think I have figured it out. There is s small notch in the base just by the ethernet connection area that I guess pairs up with the mounting 'keyhole' at the label end. Best option to mount Xo-1 is facing down like the Ruckus APs? How do I use this tool to remove the t-bracket? I have the X1-3 this thing is stuck on. On the bottom left-side (looking from the bottom) there's a small hole. Insert the pin and push it in. Now lift the tab on the t-bracket at the ethernet connection and you should be able to slip it out of the t-bracket. There was a question on best option to mount Xo-1 and no one has answered that. How are we supposed to install this unit. Assuming it will be faced down like Ruckus, then what is the prupose of the two N type connectors. Does it work for both frequencies? 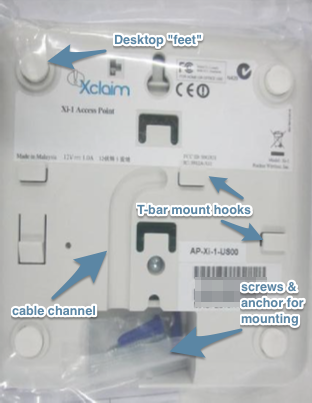 In case installed with omni antennas on N-type connectors, do we have to install the unit upright (Omni antennas in vertical direction)? I need to install Xi-1 on the ceiling and need to secure it with a lock or screw. Are there any mounting brackets available? Looking at the Ruckus R300, the bottom design is very similar to the Xi-1. Possible to use this? The part number is Ruckus: 902-0118-0000. Xi-3 has mounting that can accommodate drop ceiling in which the tiles hang below the grid but the Xi-2 does not have that same off-set mounting hardware. Where is the kit to support this more high end ceiling? Where are the instructions for mounting the Xi-3 to a drop ceiling? Nothing came in the box and I can't seem to find any other resources. Mainly I am wondering about how to best run the network wire out the back and up into the ceiling tile without it looking like a hack job. Thanks for your help.